…that beginning in the late 1800s, the Heublein Restaurant in Hartford served its thirsty customers pre-mixed cocktails that became so wildly popular that they had to build a distillery just to meet demand. In 1875 the Governor’s Foot Guard’s annual picnic was cancelled due to rain, but the Heublein Restaurant had already mixed up large batches of cocktails for the occasion. Instead of disposing of the stored cocktails, they realized they were servable. The two brothers who ran the establishment did not let this go unnoticed, and in 1890 when the sons took over the business, they shifted their focus to “ready-made” cocktails. The company survived the Prohibition years, and by the late 1930s they acquired the importation and distribution rights to Smirnoff vodka, as well as numerous other international brands in the following years. Even with the import and distribution business booming, they kept up with the demand for pre-mixed cocktails and produced traditional martinis, sidecars, and stingers, as well as trendier drinks like the Brass Monkey and Hobo’s Wife. 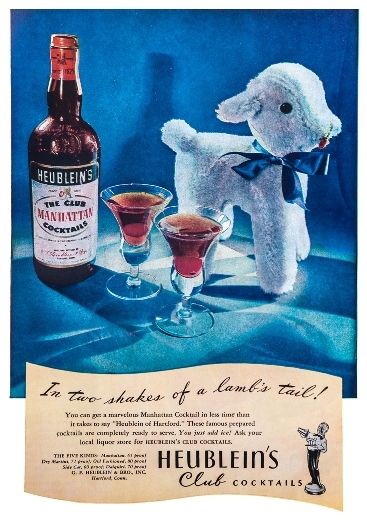 The Heublein name was ubiquitous in Connecticut bars and restaurants until recently. In 1982 the RJ Reynolds Tobacco Company acquired Heublein for $1.2 billion, and over the next few years the business was absorbed or sold off to other companies. One thing that remains, however, is a loyal following of vintage bottle collectors who take seriously the task of completing their collections with every Heublein ready-made cocktail.